I was never the little girl who dreamed of being a bride. I was more interested in growing up to be Godzilla, or perhaps Skeletor from He-Man. If I crushed cities or ruled Castle Grayskull, I could wear a fancy white dress any old time, no man necessary. As a teenager, I told friends that if I ever got married, it would be in a bathroom at the Mall of America, by an Elvis impersonator. So, basically, I’m not the romantic type. In fact, I dread wedding invitations, foreseeing gift buying and embarrassing dance parties. Nonetheless, I recently headed to 98.9 WOKO’s Bridal, Health & Beauty Expo at the University of Vermont’s Dudley H. Davis Center. 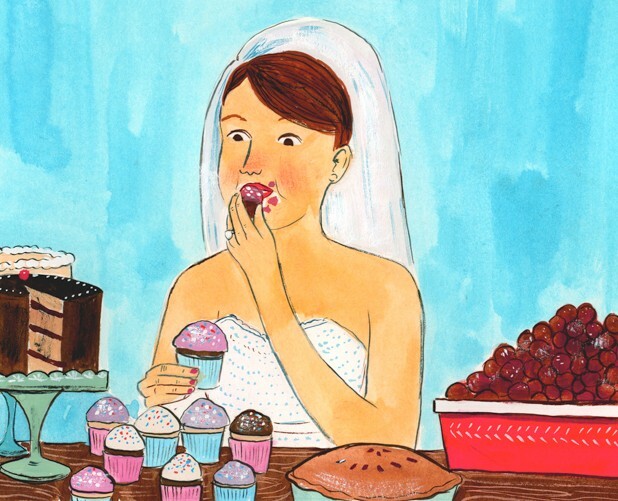 No, my boyfriend of 10 years isn’t making an honest woman out of me. I was there to eat. A friend and former wedding singer planted the idea in my head. She said she had made entire meals from the fare served at the wedding shows she used to attend to meet potential clients. I decided to take her off-the-cuff remark as a challenge. How nourishing can wedding samples be? 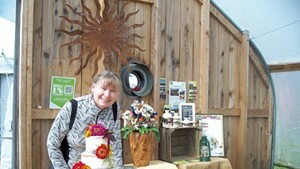 Would a noontime visit to the Bridal Expo allow me to skip lunch? I drove over to UVM to find out and discovered a jammed parking area, despite having arrived promptly at noon. Many drivers seemed to have double-parked in their rush to get inside. Once inside, I could see why the brides-to-be were in such a hurry. As one mother of the bride standing behind me complained, “It’ll take us an hour just to get in here.” The line stretched from the building’s entrance all the way up the stairs to the ballroom. Clearly, I had found my way to the day’s hottest ticket. Once I was in the Grand Maple Ballroom, about half an hour later, my first stop was obvious: The UVM home team had appetizers ready for me. No one will dispute that it sounds cheesy to have your wedding catered by Sodexo. But the company’s caterer, Flavours, boasts a staff that would make most Vermont foodies drool. Led by former Burlington Country Club chef John Brandes, Flavours’ special event chefs are Kate Hays, of Burlington’s sought-after Dish Catering; and Christophe Lissarrague, chef-owner of the now-closed Christophe’s on the Green, Vergennes’ legendary fine-dining destination. That’s not a bad team to enlist to feed your nearest and dearest mini beef Wellingtons and roasted halibut with sun-dried tomatoes and pesto sauce. At the bridal expo, I wasn’t the only one packing my mouth with Flavours’ housemade tortilla chips. While the real future brides, kitted out almost uniformly in skinny jeans, may not have shared my goal of getting a full meal, they were just as interested in filling their plates with chips and dip. Of the three flavors, I was particularly fond of the tomato-and-garlic-flavored Mediterranean. I made a mental note to return to Flavours later if I was still hungry. My original plan was to start with savory food, then do another round for dessert. But the crush of the crowd was such that I realized I’d need to stay on track and hit each booth in order. That meant my chips-and-dip course was immediately followed by wedding cake from the Lighthouse Restaurant & Lounge in Colchester. Chocolate cake with raspberry butter cream? Yes, please. The frosting burst with berry flavor, even if the cake was a little too fluffy for my taste. Plus, I was offered a coupon for $50 off my rehearsal dinner. I didn’t have the heart not to take it. Maybe staging a fake rehearsal dinner would be worth it to enjoy a chateau bistro steak with port-blue cheese demi-glâce or two. At the very next pair of tables, belonging to Grand Isle’s Tasty Persuasions Catering, I found my main course. I started by attacking the cheese board, including a wheel of Brie topped with homemade jam. I shoveled tiny phyllo bowls filled with spinach and bacon into my mouth before moving on to cucumber tea sandwiches and Caprese skewers. Finally, the end of the table revealed the mother lode: the show’s only chafing dish of hot food. The meatballs inside were delicious, a meltingly tender blend of an Italian nonna’s secret recipe and a Swedish mormor’s proud tradition, bathed in a sweet and tangy tomato sauce. So far, my meal had focused primarily on the major celebration food groups of chips, cake and cheese. It was time to get some fiber. Luckily, international chain Edible Arrangements had me covered. I listened to the spiel and took a free calendar so I could score a skewered, heart-shaped slab of pineapple dipped in chocolate. Not exactly a salad, but I took what I could get. I was tempted to ask for a strawberry, too, but was afraid I might hear a roar of “More?” like the one uttered by Mr. Bumble in the film version of Oliver! I was already hitting capacity, anyway. I snagged a petite chocolate-dipped cookie from the Middlebury Inn as a sugary warm-up on my way to the table for Richmond’s Snaffle Sweets. A number of more ample brides-to-be surrounded the display. Apparently, I wasn’t the only one who’d spied the lure of baker June Banks’ stacks of cupcakes presented on tree stumps. Which to choose? Some brides who had already started families took two, explaining that they were getting one flavor for themselves and another “for the kids.” Without that excuse, I passed up the apple-cardamom with cinnamon butter cream and key-lime-filled cupcakes in favor of a candy-pink one. It was described as Champagne flavored with a Champagne butter cream, and I did detect a light inflection of alcohol along with the crunch of sugary-pink, pearlescent sprinkles. The smaller display area beside the ballroom contained few edible samples, but I was able to acquire more vegetal matter courtesy of Have Your Cake Catering. A server made her way through the show with asparagus spears wrapped in prosciutto, a suitably elegant offering from the Skinny Pancake’s catering division. The experience didn’t make me a convert to weddings, but plenty of local options exceeded my low expectations of wedding food. Just about any of these caterers would be a far better culinary choice than whatever faux-Elvis could bring to the Mall of America bathroom. The original print version of this article was headlined "Nibbling Nuptials"